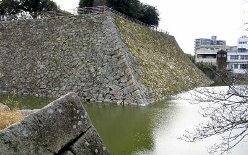 Mihara Castle is classified as a flatland castle (its layout: Teikakushiki), and is located in Hiroshima Prefecture. During the pre-modern age, it found itself within the borders of Bingo Province. 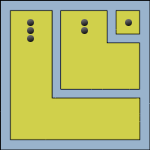 It is associated with the Kobayakawa, Asano clans. Dates in use: 1567 - 1871. A tragedy has taken place here. Despite having been awarded National Historic Site status, the site wasn't protected from train tracks being laid atop what remained. Anyway, this was an interesting little castle which was made of small, connected islands. Land reclamation has seen the ocean retreat several kilometres. Just three buildings relating to the castle have managed to escape destruction, all are gates. 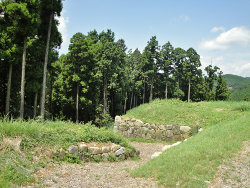 Two gates remain in Mihara city but were moved away from the castle. The remaining gate was relocated South to a small island in Japan's inland sea. 1567 The castle was built by Kobayakawa Takakage. 1568 Takakage transferred his residence to here from Takayama Castle. 1582 The castle was completed. 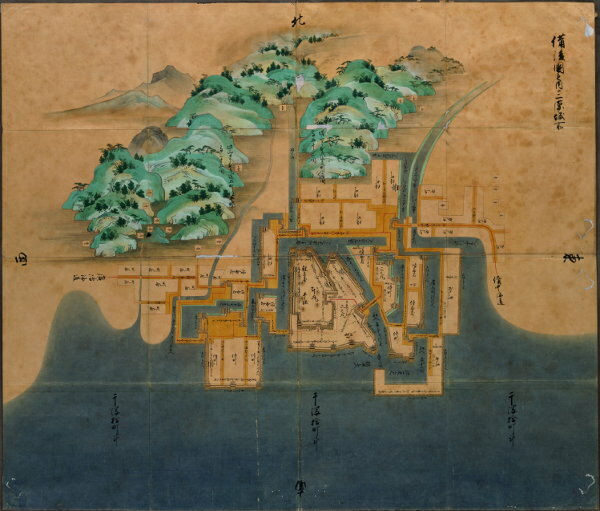 1587 Takakage was transferred to Najima Castle. 1595 Takakage returned utilising the castle as the place for his retirement. 1600 The Fukushima clan were handed control of the domain. 1619 The Asano clan were transferred here. 1663 The palace of the main enclosure was rebuilt. 1707 Repairs to damage caused by an earthquake were completed. 1871 The castle was decommissioned. 1894 The main enclosure was used for storage space by the railway. 1957 The site was awarded National Historic Site status. 1975 Bullet train tracks were driven through the centre of the remains.